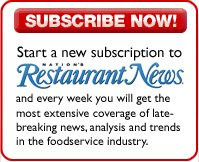 This week is always a difficult one at Nation’s Restaurant News, because we lay out our special MUFSO issue. MUFSO is, of course, our annual conference for chain restaurant operators (this year it’s October 4-6 at the Hilton Anatole in Dallas), and if you’re a restaurant operator and haven’t registered yet, well, I don’t know what to say. I could ask what’s wrong with you, but that would be impolitic, so instead, I’ll just give you this link, allowing you to register for half price. Because I’m that nice. So for the first half of the week I’m always scrambling to finish the stories that I have to write for the issue. Our focus this year, by the way, is an examination of the likely restaurant landscape in the aftermath of the recession. It’s a good read, trust me. This week is also when Star Chefs chooses to hold its International Chef Congress. I haven't managed to make it there in the past two years, but on Monday afternoon, with Blackberry in-hand so I’d know when I needed to go back to the office to interview people, I did manage at least to stop by the congress trade show, where I caught up with people from Pork Board and some nice folks from New Zealand. I sampled a new variety of New Zealand apple called the Envy, which, like the Jazz apple that I love, is a cross between the Braeburn and the Royal Gala. It had almost pear-like qualities because of its very floral aroma. Then I went back to the office, finished my story on the future of fine dining (in a nutshell, recovery will be slow and fine dining restaurants have adjusted by expanding their bars and giving their customers more control over how much money they spend and also how much time they spend in the restaurant — it's now okay to have a cocktail and a snack in most fine dining establishments, not just a full-on multi-course meal). Then I went to the James Beard House for a full-on multi-course meal sponsored by the O‘ahu Visitors Bureau, which, you may recall, brought me to that fine island earlier this year. That was Monday night. Tuesday I mostly lay low; I just went to a little party at Bar Boulud introducing a new program called Perfect Pairings, in which liquor companies sponsor cocktails and other beverages to go with specific foods. It's a good way to encourage the upsell of a tasty beverage. My friend St. John Frizell was there, shaking a grapefruity gin cocktail. Most of the time he's at his new restaurant in Red Hook, Fort Defiance. He got after me to stop by, which of course I should do. Wednesday found me at MAD46, the rooftop venue of the Roosevelt Hotel. I was there for the launch of Kolache Mama, a new chain that wants to popularize the East European pastry by stuffing it with all sorts of non-East European things like hot dogs and scrambled eggs and whatever else people might want inside of them. It was a weird party. Pretty young women in pink T-shirts pointed us to the check-in table where we were handed check-in cards with our initials on them. Then a humorless bouncer showed us to an elevator where another humorless bouncer took us to the rooftop, where we handed in the check-in cards we were just given and then we were let into the party. I guess that was supposed to make the party seem exclusive, I dont know. I tried a couple of kolaches and ran into my friend Sara Bonisteel of AOL, and we headed to the next party of the evening -- the launch of John Besh's cookbook. Now that party really did seem exclusive. It was also on a rooftop, but it was a private penthouse residence on the corner of 93rd Street and Park Avenue, thank you very much. A bartender handed me a Sazerac and I went outside to enjoy a buffet of shrimp & grits and rich pastas and other goodies while hanging out with John Besh and his famous chef friends like Gavin Kaysen of Cafe Boulud and Anita Lo, whos working on renovations of her restaurant Annisa while doing the food for Rickshaw Dumpling Bar. It was at that party, with all the smart people there, that the mystery of the previous week's Beard House dinner was explained to me. What, I had wondered, were people from the big network morning shows doing eating the cuisine of Dante de Magistris? Grub Street Boston was kind enough to find out that Dante's publicist wanted him to be on TV so the restaurant would get more destination dining. But the question to me wasn't why a restaurateur might want morning show producers to eat his food, but how to get them to show up at the Beard House, and past their bedtime to boot. Bret, silly, it was explained to me, Dante's publicist also represents celebrity chef Todd English. Ah. Solutions to mysteries are so obvious once you know them. I actually had Thursday night off, and on Friday went to an odd but charming event called Le Fooding, a French-organized tasting event to benefit hunger-relief organizations. I took the subway to Long Island City and almost turned around and left once I saw the line to the event. I wondered what would be more rude, not going to an event that I said I would go to, or announcing the fact that I was a member of the press and wondering aloud if there might be a special line for powerful and influential people like me. Instead I took option three, which was to follow Gael Greene around the corner to the VIP line and get ushered inside, past the actual proper paying guests. I'm not sure why the line was so long -- you check off a person's name and let him or her in; it should take maybe six seconds -- but my embarrassment at my priveleged status didn't keep me from taking advantage of it, and soon I was in a pretty garden listening to jazz and eating chicken necks made by Wylie Dufresne and the spicy pork lettuce wraps of David Chang. There was even a special VIP room for non-paying guests, where we could dip into steaming-cold bowls (steaming from dry ice, you see) and drink gin punch, or drink more Champagne. I mostly hung out with people from d’Artagnan, whom I understand were later escorted from the party due to rowdiness. But I had already taken my leave at that point. Also at the party were Andrew Knowlton from Bon Appetit, whom I hadn't seen in a very long time. Kate Krader of Food & Wine was coming as I was going. I spent early Monday evening with a nice Quebecoise woman named Katerine Rollet, who does a food blog for Montréal’s tourism board. She, or her bosses, or a combination thereof, wanted to find food connections between New York and Montréal. You’d think that would be fairly easy. Montréal's just an hour flight or an easy six-hour drive away (go up the thruway, turn left at Montréal), but apart from Milos, which also has a restaurant, older than the one in New York, in Montréal, and Riad Nasr of Minetta Tavern, who is from Montréal, the only other connection we could find was T Poutine, a restaurant on the Lower East Side that specializes in the Québecois dish poutine, which is French fries covered with cheese curds and gravy (think nachos, only with French fries, cheese curds and gravy instead of chips, melted cheese and salsa), there's not much cultural culinary dialogue between what are arguably the two best food cities in the Northeast. Top Chef alumnus Spike Mendelsohn would have been good, as he’s from Montréal, but he’s not in New York anymore. As far as Tourisme Montréal was concerned, Milos was too high-end for Katerine’s audience, and as far as I was concerned Kieth McNally’s restaurant empire, which includes Minetta Tavern, were too difficult to work with. So I made reservations at T Poutine and the authorities in Montréal decided that it would be a good idea to compare New York and Montréal bagels. New York is more famous for its bagels than Montréal, but the Montréalais are adamant about their product's superiority. So we met at the original H&H Bagels in the remote, industrial reaches of 46th St. and 12th Ave.
Katerine was not impressed. But from what I understand a Montréal bagel is a different animal from a New York one — crustier and more pretzel-like. She was nice about it, though, and expressed enthusiasm for the everything bagel, which does not exist in her hometown. From there we were supposed to eat at T Poutine, but despite my having made a reservation there, it turns out that the restaurant is closed on Monday. This could have been a disaster, but Katz's Deli is just down the street from T Poutine, and is a worthy comparison to Schwartz's, a Montréal restaurant known fro its smoked meat, which is similar to corned beef. Technically, that means Carnegie Deli would have been a better comparison, as Katz's is better known for its pastrami, but it was nearby, and a deli institution of similar gravitas, so we went there. Not surprisingly, Katerine preferred Schwartz's smoked meat to Katz's corned beef, but, quite apart from the fact that she works for Tourisme Montréal, because I wouldn’t accuse her of being biased because that would be rude, she was raised on Schwartz's. Also, this was her first time having pastrami, and she didn't take to it readily. To her, the taste seemed artificial. What can I say? New York is a big, grown-up city. It can take a lump or two from time to time. Katerine’s colleague, who has the great name of Tanya Churchmuch, recorded our experience at Schwartz's on video, which you can enjoy by clicking here. “That’s Duff Goldman,” said Metromix’s Matt Rodbard. “I don’t know who that is,” I said. I don’t think Matt was being obtuse, he was just having fun. And I was being a curmudgeon who doesn’t watch food TV — like lawyers don’t watch law shows and doctors don’t watch medical dramas — because there’s already enough food and food-related things in my work life. I don’t want to sit in front of the TV at home and watch more of it. Being in the presence of a celebrity you don’t care about can be awkward, because the fawning fans look so pathetic and I feel embarrassed for them. We were at the James Beard House, at a Greens event. That’s what the Beard Foundation calls events targeting people younger than 40. I think it’s an attempt to create a tribe of young food enthusiasts who are loyal to the Beard Foundation, and I’m not sure how well it’s working. Greens have been around for as long as I’ve been in New York, but I don’t hear about them much. This particular party was in celebration of Jack Daniels’ birthday, which is celebrated for the entire month of September as no one knows the exact day on which the whiskey’s namesake was born. I don’t expect that anyone has tried too hard to find out, either, as not knowing gives Jack Daniels, the company, an excuse to celebrate and promote the brand for an entire month. Duff Goldman had made a 150-pound human-shaped cake that looked like Jack Daniels. It was pretty cool. My friend Andy Battaglia of The Onion was appropriately impressed. I was more interested in checking in with Dave Wondrich, the cocktail historian, drink maven and delightful person who had developed the cocktails for the evening — the Monkey Nut and the Little Ricky. The monkey nut was a type of Manhattan with orange bitters. I asked if he was using Regan’s orange bitters. Their creator, Gary Regan, was Nation’s Restaurant News’ beverage columnist, and thus we are forever inextricably bound. In fact, Dave said, he was using a blend of Regan’s bitters and another company’s orange bitters. He said the New York tribe of cocktail makers had all decided pretty much simultaneously that one of those bitters was too orangey and the other was too bitter, so now it’s common practice here to combine the two. Tribe’s my word, not Dave’s, because tribes are the theme of this blog entry. But Gotham’s mixologist community really is a tribe. It is. Anyway, the Little Rickey was exactly that. Not to say it was Desi Arnaz Jr.
Dave explains: Jo Rickey, of Fulton County, Mo., was a prominent Democratic lobbyist at the end of the 19th century. His signature drink was bourbon with soda water and lime juice; later, people made it with gin. So a Rickey can be any cocktail of booze, citrus and soda water. This one was made with a fancy small-batch bottle of Jack Daniels, a little honey syrup — an addition of which Jo Rickey would not have approved, as he believed sugar heated the blood, Dave said — and lemon juice, shaken, poured into cylindrical shot glasses and topped with sparkling water. Little Rickeys. I didn’t meet Duff Goldman, and during all the speeches in honor of Jack Daniels I hung back and let the gawkers gawk, but he sounded like a smart, good-natured guy. “Let them eat cake!” declared Beard Foundation president Susan Ungaro, which was silly of her, because, as Duff pointed out, the person who originally said that was beheaded. As you may know, that sentence was supposedly uttered by Marie Antoinette, Queen of France and wife of King Louis XVI, when she heard that the peasants had no bread to eat. In fact, I believe what she was supposed to have said was “Qu’ils mangent de la brioche,” or, “they should eat brioche.” It displayed her failure to comprehend the fact that her peasantry was so poor that it had nothing to eat — that their caloric shortfall caused by the lack of ordinary bread could not be alleviated by switching to richer, egg-enriched bread, because they didn’t have that either. Ignorance is not a crime, but it’s no excuse, either, and perhaps her executioners decided that it should, in fact, be a crime. Anyway, they killed her, and uttering her infamous declaration at an event of well-heeled young New Yorkers who have been spending the evening gorging themselves on ribs and little mac & cheese tartlets is weird at best. It was nice that Duff knew that. Also, incidentally, his cake was delicious. Anyway, tribes. Legitimate tribes of cocktail makers, an attempt to invent a tribe of young Beard Foundation devotees. In recent weeks over at the listserv of the Association for the Study of Food and Society , in which I participate, there was quite a kerfuffle that started with a discussion of the meaning and sociological implications of the word “gastronomy,” and that ended with the departure from the list of a person who felt completely justified to hurl ignorant, baseless and personal insults at the gastronomy program of Boston University simply because she felt like doing so. Other members of the listserv disagreed. She left in a somewhat self-righteous huff, and some of those who remained began a navel-gazing exercise into what the ASFS was. It is, Ken Albala suggested, a tribe. I had been at another tribal event the night before. It was the second anniversary party of Bobo, Carlos Suarez’s plaything of a restaurant in the West Village. I don’t mean “plaything” in a bad way. I mean that it has very personal touches appropriate for his intention, which was to make his restaurant like a private home where he was throwing a dinner party, only you had to pay to eat there. Only recently did he relent and put a sign bearing the restaurant’s name outside the house, on 7th Avenue South and West 10th Street, where the restaurant’s located. He has a top-shelf cocktail developer in Naren Young and a well pedigreed chef in Patrick Connolly, and a dining room that I find enchanting. And he has style. He has a turntable and a collection of vinyl. At the party he served Champagne in classic tulips rather than modern flutes. Tulips do cause a drink to slosh, but there is something extra-celebratory in being drenched in Champagne, even if inadvertently. Usually parties like that are inhabited by fellow members of my own food-writing tribe, but I was an alien at this gathering which seemed otherwise to be populated by Carlos’s well-groomed, not-quite-lock-jawed Upper East Side friends whom I suspect might otherwise been eating at the Waverly Inn. At least that’s what I surmised. I don’t know, as I don’t read the society pages. It seemed like some of the people there would have been mentioned in them, though. They all seemed to know each other from the monosyllabic prep schools they had attended together. I ended up chatting with young Diana Foote, of the Memphis Footes. I don’t know if there really are Memphis Footes, but Diana was from Memphis, and she vacationed on Martha’s Vineyard (“not Nantuckett?” I thought), although her current visit to New York was making her consider visiting the city more often. They were gracious and lovely people. Many of them actually brought birthday gifts for the restaurant. There was an unusually large percentage of very tall blond women there. There was also an unusually large percentage of very tall blond women at my next party of the evening, the opening of Le Souk Harem. I was invited by the Hall Company, who were doing PR for the restaurant’s food (the chef consultant is Doug Psaltis), but the party was really by Lizzie Grubman, whom you might remember as the society publicist who faced criminal prosecution some years ago when, in a fit of pique, she ploughed her SUV into a bunch pedestrians who were in her way when she was leaving a party. This scenester tribe also has a bunch of tall blonde women, but rather than being gracious and elegant they’re tacky and boorish. One physically moved me out of her way so she could walk down the stairs. The restaurant itself had hookahs and belly dancers (dancing to, among other things, Rockin’ the Casbah by The Clash — oh yes, they went there). It all seemed oddly out of place in these dour times. Anyway, it wasn’t my scene, but I did have a tasty Caipirinha there. So I was at Bobo and Le Souk Harem on Tuesday, and then took Andy to the Beard House on Wednesday. And then Andy took me to Le Poisson Rouge, a music venue on Bleecker Street that I remembered as Life, a loud nightclub catering to the same tribe as Le Souk Harem. But Poisson Rouge is a dark and arty spot, and performing there was Circulatory System, and they are members of Andy’s tribe. Andy is a music writer who went to the University of Georgia, and Circulatory System is a group of psychedelic musicians based in Athens, Ga. When Andy was in college they were Olivia Tremor Control, and he said they had tremendous influence on him. I don’t think I knew what psychedelic music was, really, but I have an idea, now, and I think it has given me insight into electronica that might help me appreciate it more the next time Andy takes me to one of those shows. I tend to focus on lyrics and melody and harmony when I listen to music, but Circulatory System was really creating an entire atmosphere of sound that had nothing to do with those things. They just kind of created a music bubble that filled the room, so I just let it wash over me and it was a lot of fun. Sounded pretty, too. We went back stage after the show, and Andy was greeted with hugs and happy noises of greeting that pleased him. He was clearly glad to reconnect.